We present an isothermal fluctuating nonlinear hydrodynamic theory of crystallization in molecular liquids. A dynamic coarse-graining technique is used to derive the velocity field, a phenomenology which allows a direct coupling between the free energy functional of the classical density functional theory and the Navier–Stokes equation. In contrast to the Ginzburg–Landau type amplitude theories, the dynamic response to elastic deformations is described by parameter-free kinetic equations. 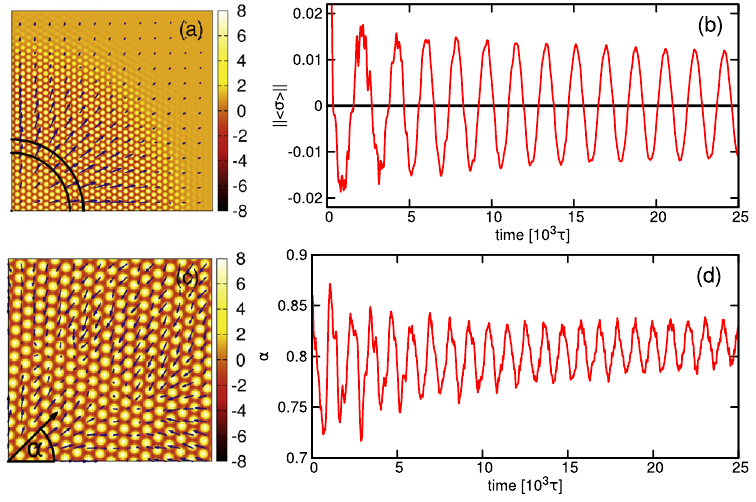 Employing our approach to the free energy functional of the phase-field crystal model, we recover the classical spectrum for the phonons and the steady-state growth fronts. The capillary wave spectrum of the equilibrium crystal–liquid interface is in good qualitative agreement with the molecular dynamics simulations.